It’s that time of year again; it’s time to publicly reflect on our accomplishments and shortcomings of last year and set our sights on the future. If you are like most people, you developed a few goals for 2018, and you may have even accomplished a few of them. Our hats are off to you! If you did achieve your goals, you likely did more than make a mental “resolution.” Now, if there were a few goals that you didn’t achieve, you probably learned that it takes more than will-power to fulfill the ambitious objectives you’ve set for yourself. One of my goals in 2018 was to read about and learn how leaders not only set their strategic goals, but the steps they take to successfully execute on those goals. The most notable book that helped shift my thinking in approaching this seemingly overwhelming topic was “mastering the Rockefeller Habits” by Verne Harnish. In fact, I believe, it is a must-read for anyone serious about building a successful team in 2019. Great leaders can maintain engagement and buy-in from their team so that their strategic goals also align with the company’s. But, how? The answer is successful planning. 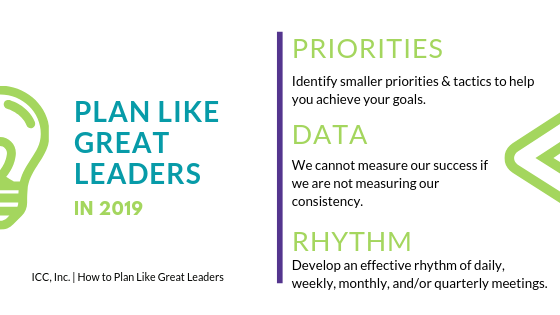 As noted in “Mastering the Rockefeller Habits”, it remains seen that we should create a few small goals, assign metrics, measure and apply consistency towards achieving those goals. However, the timing around that concept has shifted. Below, I have laid out a framework for how this shift can impact goal setting, and what you can do to maintain consistency throughout the process. Priorities – Instead of planning for all of 2019, I’ve found it more useful, and not to mention – realistic to create a list of five priorities for the upcoming quarter (or twelve weeks). Identifying smaller priorities and breaking down the tactics to help you achieve each goal or priority, can alleviate some of the overwhelming feelings that you may have when it comes to answering the question “Where do I begin the journey to achieving this [larger] goal?” What is a long-term goal of yours? How can you create a timely plan to make sure that vision comes to fruition? Data – As you move through your plan, you can collect and measure data around how the team is performing on a daily and weekly basis. Assigning a daily or weekly metric to each member of the team can be helpful in measuring whether or not each individual is meeting their goals. Again, these tasks can be tremendous help in driving performance, and should align with the short and long term goals of the company. We cannot measure our success if we are not measuring our consistency. Rhythm – It is important to develop an effective rhythm of daily, weekly, monthly, and/or quarterly meetings. This will drive employee engagement, alignment and accountability amongst team members. It is the consistent application of these processes that allows a natural work flow to lead teams to accomplishing their goals. Implementing these practices in the workplace will facilitate a culture of achievement and ultimately drive employee performance. How will you execute your goals in 2019? Will you lean on old practices to get new results, or will you make the commitment to lead like great leaders do?